Here’s the second recipe from Chef Fabio Viviani of Top Chef All Stars. The first recipe was the stuffed baby potato recipe from yesterday. Don’t make the mistake of using robust flavor olive oil like I did. The cake still tasted good. It’s surprisingly moist. The berry sauce was a bit too oily for me, but the lemon peel totally makes it delicious. I added extra lemon peel to bring out the lemon flavor even more. 1. Preheat oven to 350° F. Spray 13- x 9-inch baking pan with nonstick cooking spray; set aside. 2. Beat eggs with 1-1/4 cups sugar in medium bowl with electric mixer on medium-high speed until eggs are pale and thick, about 5 minutes. Slowly beat in milk. Slowly add flour blended with baking powder and mix just until blended. Add 1 cup extra light tasting olive oil and beat just until blended. Turn into prepared pan. 3. Bake in center of oven 30 minutes or until toothpick inserted in center comes out clean. Cool on wire rack 10 minutes; remove from pan and cool completely. 4. Meanwhile, for blueberry sauce, combine blueberries, remaining 1/2 cup sugar, remaining 1/4 cup olive oil and lemon juice in 2-quart saucepan. Cook over medium heat, stirring occasionally, 5 minutes or until blueberries start to burst. Remove from heat; stir in lemon peel. Let cool to room temperature. 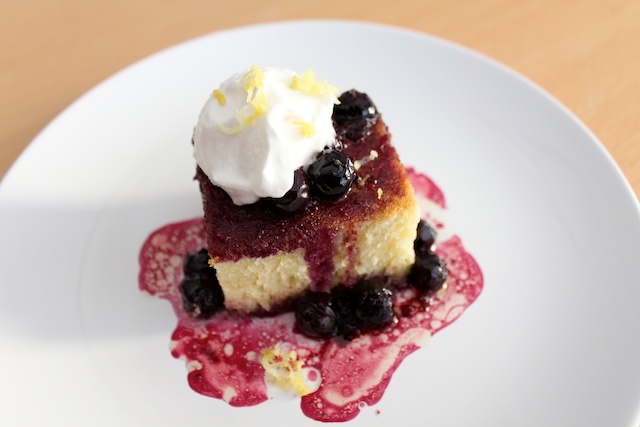 Serve blueberry sauce with cake. This cake sounds interesting. Only I find it very unusual to add oil to a fruit sauce, so I think I will make it without the oil and bake the cake with 3/4 cup of oil.